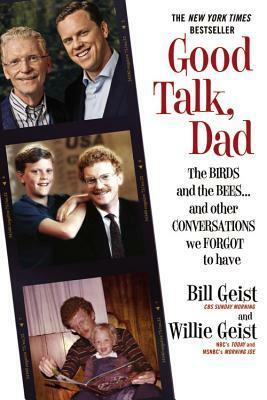 From popular TV hosts and bestselling authors Bill and Willie Geist, a hilarious testament to the special nature of father-son relationships.In GOOD TALK, DAD, this talented father-son team shares stories of their funny and heartwarming relationship. Told in a unique back-and-forth banter style, this extended conversation riffs on everything from music and sports to summerFrom popular TV hosts and bestselling authors Bill and Willie Geist, a hilarious testament to the special nature of father-son relationships.In GOOD TALK, DAD, this talented father-son team shares stories of their funny and heartwarming relationship. Told in a unique back-and-forth banter style, this extended conversation riffs on everything from music and sports to summer camp, driving lessons, and family life. Imagine Big Russ & Me meets Sh*t My Dad Says. After Bill went public with his struggle with Parkinsons disease, the Geists decided to collaborate on this book so their children and grandchildren would have a record of their unique bond. Now that Willie is a father (and Bill a grandfather), Willie has continued Bill's child-rearing traditions in the hopes of carrying on the riotous Geistian parenting legacy. The result is delightfully entertaining, wildly funny, and poignant as well. For years, I have enjoyed Bill Geist because of his wonderful, warm, and light-hearted contributions to CBS Sunday Morning. This book is a continutation of that style and it is obvious that the apple does not fall far from the tree when you hear Willie Geist share his side of the story.This was a fun read (or listen) and had many laugh out loud momentscially Bill's conversation about the Rolling Stones in about Chapter 10.Enjoy!!! I really haven't seen the Geists on tv, but I thought the premise of father/son essays to each other and about growing up was interesting. Turns out to be some really humorous, precious stories about a family that really loves each other. The second half of the book really clinched it. Laugh out loud funny at times. Good read. Father and son news reporters describe their take on life from their own perspectives. Subjects include fatherhood, music, sports, holidays, summer camp, and the memories of family life. Sometimes entertaining, other times rather boring. Hilarious audiobook! I enjoyed the back and forth story telling and true assessment of their family dynamics. Interesting short stories, but not enough to make it one of those books I couldn't put down. Memoir from the viewpoint of son and father. Great, true stories, some poignant, some silly, all funny. Love, love, love this book! It was sweet, funny, sincere. If you need a laugh out loud read this is it.